Precision-machined, steel tool safely removes, installs and adjusts front and rear sights on handguns. Clamp your slide into the tool and line up the sights with the tool’s pusher tip for installation, removal, or adjustment. Mobile jaw customizes to the height of your slide and can be used from the right or left side. Delrin® liner protects slide from scratches. Includes three sight pushers that attach to the end of the sight-pushing bolt. 1⁄4" square tip works perfectly on shallow, cross-dovetail sights. Hold Down Clamp helps prevent the slide from twisting in the frame of the P500 by applying extra force to the top of the slide. Provides a secure seat in the tool when working with hard-to-remove sights or slides with angled sides, like the Springfield Armory XD and the S&W M&P. Slide Stop speeds up the process of performing the same sight job on a large number of the same model pistol. Stop simply screws to the P500 frame and lets you position each slide in exactly the same place to perform the necessary sight adjustment quickly and easily. 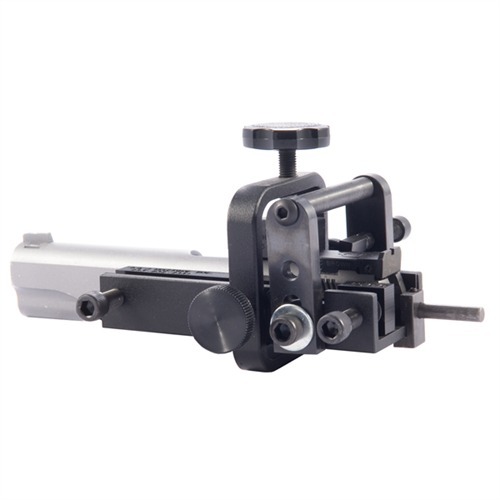 P500 Universal Sight Tool Kit combines P500 Universal Sight Tool with the Hold Down Clamp and Slide Stop to provide the ultimate of flexibility and versatility in a sight adjustment tool. ?SPECS: Steel, black, powder-coat finish. Approximately 5" (12.5cm) long, 2" (5cm) wide, 1" (2.54cm) high. Instructions included. Hold Down Clamp – Steel, powder-coated, black. Approximately 4" (10cm) long, 1½" (3.8cm) wide, 3¾" (9.5cm) high). Comes with clamp assembly and instructions. Slide Stop - 1018 steel, black oxide finish. Approximately 1¼" (3.2cm) long, ½" (1.3cm) wide, 1" (2.5cm) high. Includes stop block, stop pin, hex wrench, (5) 6-32 setscrews, and instructions. 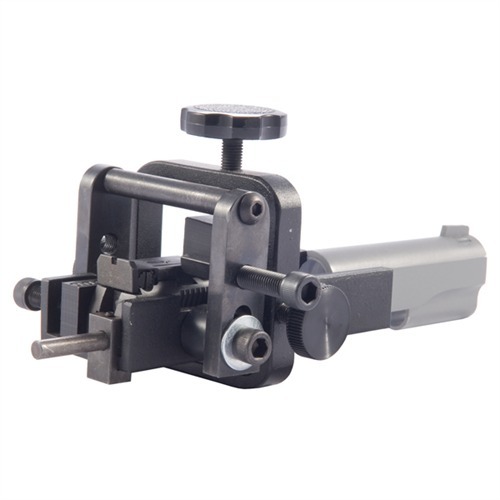 P500 Universal Sight Tool Kit contains the P500 Universal Sight Tool, Hold Down Clamp, Slide Stop, and complete instructions. I would not buy this product again because the base that forms the clamp is not made from heat treated steal and has bent due to pressure when the sight screw is tightened. It's a well designed product but I don't think the base is made from the proper type steel and as such will not buy another one of these. For the price they charge it's not worth it! After reading reviews around the net, I found people seemed to really like the P500 or not. Not much in between. Well, I swallowed hard and I went ahead and plunked down my money, and I'm glad I did. This is a well thought out unit. If you've fought trying to keep slides captured, well folks, this one does it in spades. Especially with the hold-down clamp. The barrel stop is a nice feature if you're sighting-in and need to come back to the same sight for more adjustment. I'd give it 5-stars except for difficulty with thin-based front sights. If they've set in good, they can be a pig to move anyway. Rear sight with plenty of surface are a real whiz. While making adjustment, yep, you may leave a mark on the tough sights, but a little touch up and some cold blue takes care of that. I'm going to do some experimenting with different padding materials, but let's face it, some sights take pressure. While the three pusher end units that come with the unit cover a pretty wide range, I'd like to see maye a couple more square sizes. Might help a bunch w/ the front sights. Too, if you've got a wrench that will fit the square, you can hold it right square in place. This tool works and works well. If you are going to be using this tool on a bunch of different arms, I'd recommend buying the hold down and the stop. This is a nice concept for moving sights but the base the slide sets in needs to be made from much heavier aluminum to prevent spread when the slide tries to twist under pressure from the sight moving screw. I think aluminum is the correct material for the base because it is less likely to danage SS or steel slides. It does need to be made much stouter through the use of heavier bar stock aluminum. I'm a do it your selfer,avid shooter and gun collector. Anything I work on is likely to be in the 1911 format. I've researched this tool and it performs just like you would expect it to made from these materials. This tool would be my first choice of all the sight pushers I have look at or used if only the base were more durable. I ordered the driver and the hold down clamp for my S&W M&P 45. I needed to remove the rear sight to replace the trigger blocking safety plunger and spring. Do to the shape of the slide it was impossible to drive out by hand and I could forsee nothing but damage. I ordered this product, set it up in 15 or 20 minutes. (I suggest you take your time to align it) The sight just popped right out. It went back in easily too. Of all the gunsmith tools that I have purchased from Brownells, this is absolute the worst item I have ever purchased hands down. If you are looking for a way to install new sites and want to scratch and mar the firearm, then purchase the P500. It will also take you many hours to try to remove and install with little to no success and possibly damage to your firearm. The MGW sight pusher cost more, but you get what you pay for. I can remove and install sights with a MGW in about 10 minutes. I purchased this item on 4/2013 and have tried to use it many times, only to fail each and every time. It is a total waste of money. If I could return this item, I would in a heartbeat and purchase 2 more MGW sight pushers. I have been using a "C" clamp for tough slides and those [*] XD's. This clamp made the job so much easier. XD's are still tough but finally doable. The slide stays in place and does'nt lift up or twist in the tool. This tool has worked on every slide I have tried. For about the cost of a single sight tool, you can't beat this value. This sight pusher is extremely difficult to align the pusher to properly fit the sight. Too many moving parts. I have used it on three 1911's and have had nothing but problems. The pusher tips will rotate while pressing out the sights and this will cause damage to the slide and to the sight. I used a small wrench to hold the tip from rotating. I recommend purchasing a sight pusher built especially for your weapon. I will not use this sight pusher again on any weapon. I used this Tool on a Kimber 1911 and a Sig 229. It takes a little extra time to line up, but works pefectly. If you can't afford to buy a special tool for each slide, this is your product. With over 28 years of machineist and background with firearmes I have used this tool for over 5 years in many applications.This is a great tool for the money and works great if you take your time,and follow all of the instructions almost anyone of any age group can use it with ease. This tool is hard to beat, for the money. It does work well, if you take your time setting it up, and work slowly. I have found it unusable on guns with levers on the slide, such as the Beretta 92(and the Taurus clones) and many of the Ruger P series pistols. This is the perfect tool for any gun shop to own. Can be adjusted to just about any handgun slide and very fast to go from one gun to another. It can also push the sight from the right or left side for adjustments. The only down side is that I didn't see any replacement pusher bits offered. Would be nice to have an extra set in the shop just in case one gets lost or damaged. This sight tool takes way to much time to set up and doesn't work well at all with tight dovetails such as those on Springfield XD's. A hammer and brass punch is still the best way to go. Super Blue or Perma Blue will clean the brass marks up nicely. Using a rotary motion to slide a press fit laterally just does not work. The brass tip rolls over the side of rear sights, and even broke a front sight on an XD40. Taking the pistol apart to adjust the sight is tedious. I have used this tool for many years and on a wide variety of guns. It takes an extra minute or two to set up, but has never failed to get the job done. The customer service from B&J is excellent. They replaced a broken pusher screw three years after I bought it for no charge. The tool that I have came with steel tips. I am unsure about the brass tips the other poster was speaking about. I just purchased the new Hold Down Clamp that they have. It works better than advertised. I have had & used the p-500 Universal Sight Tool for a good while and found it effective and efficient. Not the easiest tool to use, but if one takes ones time it does the job. Recently in a move I lost a couple of the parts. I emailed B&J Machine and told them I lost the parts. My fault. They immediately sent me replacement parts, no charge, and my tool is back in business. This tool damages slides, does not work "well", damages the sights it's putting on, and then falls apart. Choose another type, or use a brass punch and vise. Tool has potential, but the tips provided are metal and I ended up destroying two sets of sights as they gouged and scratch the metal. Even with cloth folded over multiple times, the tips cut through it. Perhaps a piece of thick leather between instead.The tips should be made of hard plastic like the tools walls in order to prevent destruction. The tips also "rotate" when turning the pusher screw, helping contribute to the damage.The tool should also come with top clamp as part of the package instead of the [$] option. I found the slide would rotate inside the tool without it.Good tool in theory, but these issues should be addressed. I have used this tool to adjust the fixed sights on several Sig pistols (models 220, 228 and 226) with complete satisfaction. It works reliably and does not scratch the surface of the slides. The best universal sight adjustment tool I have ever used. Several friends and other shooters at the range have used it, also to their satisfaction. It does work with limited success on many models. However, it is difficult to align correctly and continually shifts while using. The tips, that are designed not to rotate, will rotate, marring the sight and the slide if not very carefully monitored. Frequent shifts in alignment cause similar problems. The hammer and punch method causes less marring. Also, very tight sights can not be removed. I eventually stripped the push rod and was almost unable to remove the slide from the tool. This design slips often. The pusher heads rotate causing damage to both sight and gun. Slide isn't centered in the unit so you have to disassemble and reassemble for measuring, sometimes over and over to get sight perfect positioning. The tool flexes, this make close estimates and exact positioning imposible by counting the rotations. In my opinion it is a waist for any well fitted dovetail sight. For loose sights held on by a set screw it should do ok. Do not use it for anything precision. I bought this tool because I have a Sig a Kimber & a Kahr that I wanted night sights on. Buying this tool was cheaper than getting them put in by a gunsmith. I was a bit nervous at the start, but once the slide was lined up the sights pressed right out and the new ones went right in. I also bought the clamp just to make sure nothing moved. Not as hard as you would think. Good tool. Great product. it works well every time. The only thing I would want changed is polymer pushers. Sometimes the metal pusher tips can mar your gun if you aren't careful. While this tool does the job, it is a little difficult to get everything aligned correctly. Once you get the hang of it, it works well. I would definitely recommend purchasing the hold down clamp as slides which are not "squared up" in their design are difficult to work with. This is an amazing little tool! I have used it weekly and have had zero trouble. It does take a little bit of time to set it up, but after a few times it only takes a minute to setup! I use two layers of blue masking tape on the tip of all the pushers to elliminate and marring. Bought one to replace factory rear sight for another, more competition oriented. It did the job, easy to work with. The only thing you have to pay attention to is - make sure you keep it alligned well and use some sort of protection against original and new sight so they don't get marks on them, and you don't hit slide either. If you are not technically inclined - take your stuff to a gunsmith. Otherwise, this is a very nice and versatile tool!! Worked ok for first couple of jobs then I noticed pin would rotate causing damage to sight and gun as push pin would walk. As the others have said it will damage your customers gun and sights and that will make you look bad. Adjustable arm stripped out while pushing in a rear sight. universal? no. unit comes with 2 sight pushers. very soft material, both of mine broke 1st push. dubious instructions. universal should mean 'all'. PUSH TO FAR, YOU'LL DESTROY THE GUNS DOVETAILS. THANKFUL I DIDN'T BUY THE EXPENSIVE MODEL. BUY A MALLET AND ASSORTED NYLON RODS. This product is not made from heat treated steal and the base will bend and damage the gun and sights. I would not use or buy this product again for what they charge. If they upgraded the base to a stronger steal that wouldn't bend it would work better. The sight pins still can damage the gun because the base bends and doesn't hold the slide true and straight. Won't buy or use again. The push pin bends under pressure, snapping up over the sight body. The square tab also twists, marring the slide's dovetail. I reverted back to a brass punch and a tap hammer to get the job done (spent over two hours with the sight tool sold to me...ten minutes with the brass punch and hammer). This is also an incomplete tool (I spent an additional [$] for the slide clamp-down tool, and the sight pusher still didn't work). 32 years as a professional gunsmith, and I sure wish that I still had my old Williams Sight tool. There is loo much play in the pusher screws and inability to keep the slide from rotating if the sights are tight. You could use a punch and hammer just as easily, but it is a bit more precise when aligning sights back up instead of doing the "punch & correct" method. I had to build a base for the setup to mount in the vise so I could adjust the bar more easily. Without it you have to un-clamp it every time you make an adjustment. Definitely a "Jack of all trades, master of none." The MGW gun specific pushers are the way to go if you are going to use it for a business. I started with this model because I was cheap. I'm buying MGW's now. For the hobbyist it's not a bad setup for the price. I have had this tool for more than 5 years. I have used the tool hundreds of times.The only trouble i ever had was a broken push screw. That part was replaced for me at no charge by the manufacturer. I am amazed that anyone would have a problem with this item. It is very strong and durable. I highly recomend this tool. It does works but not very well. Very difficult to keep it align correctly. As you rotate the hex wrench, the tip will rotate also. It marred my sight and nicked my slide. I bought one of these from a store on another planet to swap out the sights on my Springfield XD45. It didn't work, I wound up breaking the square block and the pin on the end of the pusher screw. I called B&J and they were very nice, sent me a replacement for both free. They also told me how XD sights are installed and told me their tool wouldn't work for this application. I wound up using a punch and messed up the sight a little installing it (it still works). I tried to use the tool to install a set of Sevigny Warren Tacticals on my GLOCK 17. The tool worked great for removing the rear sight, but installing it wasn't working for me, as it didn't have the surface area to push to install it correctly. I got it on about 75% of the way, then used a punch to do the rest. I'd be happier if the screw that pushes the sight were more carefully machined (the tip wobbles as the screw's turned), but can't complain about the tool's effectiveness. I'm much happier adjusting the sight on my Walther PP with this tool than with a punch - which I can't use at the range anyway. Works good. Specially for fine tuning. I bought this tool 2 years ago for [$] and bought the whole kit. I have yet to have a gun that didn't get damaged or the sight it self got damaged. That's right, Not one successful install. Do not waste your money on this product. Been a glock armorer for 22 years and this is the best rear sight glock tool I have come across.It works on all glock rear sights. I have not used it on other rear sights so I can not comment on it usefulness on other pistol rear sights.B&j support system is second to none. I destroyed 3 parts of the tool on friday (my own stupidity nothing to do with the sight pusher. I called B&J friday and had 3 new parts the following Monday at no cost to me.works on all glock rear sights and B&J stand behind their product. Would recomend this product to anyone wanting a universal glock rear sight tool. Definately a great addition to the tool collection. I have been working on guns for the past twenty two years. I have always used the hammer and punch method. This is the way sights should be worked on. I have not found a slide this tool has not worked on. You do have to be careful when setting it up, but the results are great. I've used this tool on several handguns including the Springfield XD (a difficult pistol.) I have found a few issues with this. 1. The pins that mount on the sight screw will turn with the screw marring the sight and the slide. I have found that a modified pair of vice grips that are ground to go around the connecting bar and hold the pin still works fine. But I also add some masking tape to the tip of the pin to prevent any marring. 2. The threads on the uprights and on the sight screw stripped out after only a few uses on difficult firearms like some 1911s and the XD. The sight screw and the upright parts are now ruined on my tool making it useless. 3. The slide vice screw on one end tends to sit past the end of the slide causing the plastic vice plate to bend around the end of the slide and doesn't provide solid clamping of one end of the slide when working on the front sight. 4. Without the slide clamp that would hold the slide down, tilting of the slide can be a problem, particularly in tapered or beveled slides like the XD. All in all it's a great design and easy to use but with some flaws that create major drawbacks. I would recommend making the sight screw and the upright parts for it out of tougher material and possibly provide replacement parts. I would also recommend making the sight pins with a durable nylon tip to prevent marring. I would only recommend use of this tool with pistols that have easy to adjust sights. Im a gunsmith and i bought one of these to save time. every sight i have tried to install has been damaged. lucky that i have tools and the know how to fix the damage. great potential, just needs to be tweeked a little. Tool flexes and barrel moves in tool before the sights on my SIG move. I've used this sight pusher on over a dozen different pistols of various sizes and manufactures. It works exactly like it should. It's a universal pusher and can adjust in different ways to fit different slides. Set it up correctly and push the sight at the proper point and you won't have any problems. If you own many different brands of firearms, this is the sight tool for you unless you want to buy lots of manufacture specific pushers. I have now used the P500 to adjust 3 pistol sights. It worked fine on a Kimber and Taurus. On a Sig Ultra, the sight was in so tight that trying to move it almost bent the P500 frame. I had to lock the frame in a vice (as recommended)to prevent bending it. They should make the P500 frame heavier for guns with really tight sights. The cost would be minimul for a better product. This pusher works well on all the semi autos I tried inculding my Kimbers. I highly suggest you put it in a vise using the incuded vise spacers. It's a little cumbersome to adjust but nothing you cant master with practice. Take your time, read and understand the instructions, adjust the pin height correctly and make absoulte sure you protect the sights from the tool. By this I mean make sure you have something between the push pin and the sight because the tool will mar any blued sight. Some reviews suggest patches and that worked OK for me but I am going to find something else because I had to fumble around with patches because they covered the pin and the sight making it hard for me to see. I used the square pin with a small wrench to keep it from spinning while I turned the pin. Protect the sights, take your time and it works well. Some reviews say the base is weak but I had no issue with that at all. All and all pretty good tool. This sight tool is very easy to use and adapts to most slides. After I damaged the threads on my pusher screw and tower, the folks at B&J sent me replacement parts at no charge (even though the fault was mine). This is wonderful customer service and I reccomend them to everyone looking for a quality product. While removing an especially difficult front sight on M&P 9 the thread on the pusher rod stripped and now the threaded holes are deformed also. I used the provided wrench/tool and hand power only. What now Lieutenant? They are shooting at us. Great tool. Been using it for almost a year now. Used it to change sights on everything from CZ75 to multiple 1911's, to Glocks. Works great! I PURCHASED A P500 UNIVERSAL SIGHT TOOL THROUGH BROWNELL'S ABOUT TEN YEARS AGO. THE PRODUCT WORKED WELL ON 1911S WITH DOVETAILED FRONT AND REAR SIGHTS, HIGH POWERS,GLOCK REAR SIGHT, AND A FEW OTHER PISTOLS. THE PUSHER SCREW STRIPPED AFTER 10 YEARS OF USE, I CALLED THE MANUFACTURER, B & J MACHINE, TO BUY A REPLACEMENT PUSHER SCREW, I TOLD THEM THE UNIT WAS TEN YEARS OLD, YET THEY STILL SENT ME A REPLACEMENT PUSHER SCREW AT NO CHARGE. THE GENTLEMAN I SPOKE TO WAS PLEASANT. WITH THIS KIND OF COMPANY SUPPORT OF A PRODUCT I HAVE NO RESERVATION PURCHASING OR HIGHLY RECOMMENDING B & J MACHINE PRODUCTS. Does what it's made for. Comes with several different non-rotating tips, which is nice. I was not able to move CZ 75's rear sight and with this tool it finally worked. And it works without damaging or scratching the sight or the slight. Great tool! I used this to install custom sights on both front and rear for my S&W MP9C and SA XDM .40 3.8"/C. The tool worked well with the MP9. Removing and installing was a relatively simple task. The XDM had a very tight front sight which I ended up hammering off with an aluminum punch. I really had to lay into it. Installing the new front sight was a piece of cake. The overall functionality, design, and quality is excellent in a universal tool. It is, however, a but cumbersome to use. If you have several different gun models, this is probably the right choice. I was worried about buying this because of the negative reviews about it stripping and breaking. This thing is robust and as long as you use the bearings, oil, and don't use the main knob to tighten it will work like a champ! I highly recommend buying the additional angled Glock pieces from B&J. I've installed several Meprolights and TFO's on Glocks and XDs. Works like a charm! Worth every penny. The best sight mover for universal applications to a variety of sights needing to be either removed or installed. With the adapter (an extra attachment purchased separately)for holding a sight in line while moving, it works fantastic. Be sure to use the washers to keep the tip in alignment with the sight base. Lubricate the pusher often. Yes, it will move most pistol sights. Not all. And none will be easy. The little gadgets that fit between the drive-screw and the sight constantly spin, scratching the finish. Holding them with pliers would work if you have 3 hands and the stupid bar on top wasn't there. And don't even try it on a Beretta PX4. I had the opportunity to use this sight adjustment tool (11-08-13) at a local gun range. My pistol was shooting left and noticed the sights were not aligned as they should of been. One of the Safety Officers had this tool in the office. I couldn't believe how easy it was to drift the sight back to center. Worried about marring the blue on a sight. Take a used soda can and cut a inch long strip and the same with of the sight base, put it between the tools pin and the sight base. The tools pin will "spin" on the aluminum strip and not on the sight. Cheap protector. I DuraCoat as a side business and have used this on several guns, can safely say it does none of them well. Its just poorly made and I have to start the sights with a punch and hammer then sometimes it can finish the job. It has damaged several sets of sights leaving marks on the side especially meprolights or any other sights with a 45 degree angle. A punch and hammer work better and is cheaper. I purchased the entire collection of these. ALL the gadgets and add-ons. Thinking this will be all I need to work on my customers' sight jobs. What a complete waste of money. The pusher spins, which wears the finish OFF the sights. Not like brass that can be brushed away. This tool spun on a customers brand new Kimber and gouged the slide so much I wanted to throw up. Not to mention if you come across a stubborn sight, then the pusher rod just bends and strips out. Get a good set of brass punches and a hammer. They cost WAY less and are 110% more reliable. I have used this or should I say attempted to use this tool on maybe 10 or 12 different sight jobs. It will move a Glock rear sight and that is about all it will do. Kahr or Kimber sights? Forget it. Had to use a giant C- clamp to keep the slide in the proper spot. Now they sell another widget gadget to do this? It is impossible to put the proper amount of torque on the little small threaded pusher screw. If too much force is applied , the pusher screw simply raises up out of the dovetail channel. Seemed to work fine to remove a sight off a 1911, replacing the sight was something else. First- there is not enough room fit the pusher gaget an sight next to the dovtail and frame. Next- when pushing a tight rear sight, the frame bent causing the pusher gaget to mar the slide. The pusher tool also spun ruining the finish on the sight. I will have to replace the sight. Not worth the money and time to have to do everything over. You set the slide in the moving jaw (manufacturer's terminology), hand tighten per manual, then use a pusher to push the sight. Simple enough. Problem is, the jaw doesn't provide enough support for the slide, plus it is allowed to wiggle about a little bit. So when you are pushing the sight on top, the torque is trying to rip the slide out of the jaw. And it's almost succeeding, to the point when I had to stop for fear of damaging the slide. End result - sight not adjusted, the tool pretty useless. The reason I had to adjust it was that I dropped the gun and the rear sight moved. So it could not be all that tight. And no, I didn't forget to unscrew the little screw. And I even heated up the slide.